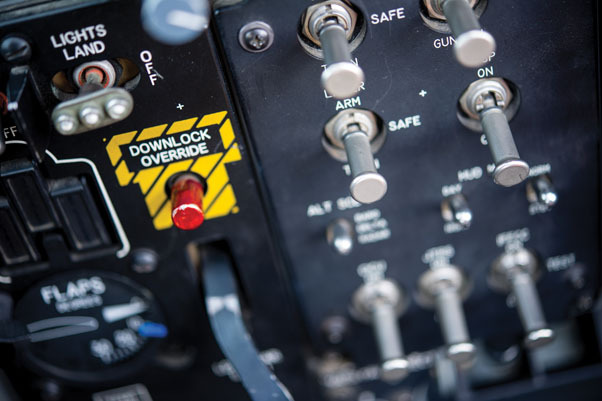 The interior control panel of an A-10 Thunderbolt II sits unused shortly before takeoff at March Air Reserve Base, Calif., Feb. 1, 2016. The 354th Fighter Squadron out of Davis-Monthan Air Force Base, Ariz., is providing close air support for Integrated Training Exercise 2-16 at Marine Corp Air Ground Combat Center, Twentynine Palms. MCAGCC conducts relevant live-fire combined arms, urban operations, and joint/coalition level integration training that promote operational forces' readiness. MARINE CORPS AIR GROUND COMBAT CENTER, TWENTYNINE PALMS, Calif. — Over mountains, rocky terrain, and oversized hills, three aircraft fly across the desert landscape. They bank and circle as they approach their destination. Suddenly, one of the aircraft drops into a steep dive. The A-10 Thunderbolt II fires its main weapon toward the ground and the thunderous roar of its 30 mm cannon rages across the valley. This sortie was part of Integrated Training Exercise (ITX) 2-16. The Marines of 2nd Battalion, 7th Marine Regiment and the A-10 maintainers staged at March Air Reserve Base, California, allowed for the successful sortie mission. After completing the mission, Capt. Ryan Rutter, a pilot with the 354th Fighter Squadron, flies 90 miles back to March Air Reserve Base, California, lands the jet and climbs out of the cockpit. “We are conducting a joint training exercise with the Marines at Twentynine Palms,” said Rutter. He believes it’s a solid stepping-stone for working together and learning how to support the Marines in accomplishing their mission. An important element in conducting the ITX is communication, not only between the Marines and Air Force but also between the pilots and the maintainers who support them. “We know that the A-10 jets are supporting fire for the Twentynine Palms Marines,” said Staff Sgt. Christopher Blackstone, a crew chief assigned to 355th Aircraft Maintenance Squadron (AMXS). Blackstone believes that because of the A-10’s specialized role, it benefits greatly from efficient interoperability between forces. “We do our best to relay to our airmen who they’re supporting and why they’re supporting,” said Chief Master Sgt. Francis Emmerling, superintendent of the 355th AMXS. He says, with the current environment of the modern day military, joint training is crucial. Emmerling stresses the importance of knowing how to work together, so that American forces may enter the theater of battle with full effectiveness.